This blog may be of more interest to fellow webmeisters than to fellow hobbyists. I am writing it largely as a cautionary tale for anyone who has a good idea for a web page. Though some of these events have been published in the past, fixing problems caused by my na�vet� and other folks' dishonesty as far back as fourteen years are still costing me many hours that that could have been put to more productive use. Hopefully, reporting my mistakes and misadventures will help other folks avoid similar problems. Please bear with the chronological account - the "what not to do part" at the end will make more sense if you do. Although this name was never used on the Internet, it did teach me a lesson. Back in the 1980s, I was so frustrated by the lack of honest Large Scale train dealers in the area that I considered starting my own store. But suppliers wouldn't talk to me unless I had a state vendor's license. I bought one, in the name of "Mad River Garden Trains." Soon I realized that I'd have to invest hundreds of thousands up front to be able to compete price-wise with the "big guys." Never mind. The only reason this is worth telling is that I discovered something important about setting up a company. I had made the name and charter of "Mad River Garden Trains" so specific that if I found some other way to make money, I would have had to start a separate company and keep separate books. I determined that the next company would be named and chartered more broadly. My own first web page came after a huge corporate layoff in 1995. My contacts who still had jobs wanted to hire me back as a consultant, but they couldn't do so unless I jumped through a bunch of hoops, one of which included "looking like a business" to the people who would have to approve the contracts. I registered with the state as "Breakthrough Communications," bought web hosting services from my ISP, and launched my first web site. The URL for my web page was btcomm.com, which may not seem important here, but becomes important further down in the article. I got the contract and several others, and have left the site up since. I'd started writing about garden railroading in the mid-1980s, publishing articles in club newsletters etc. By the mid-1990s, my articles were being noticed by industry types. A few asked me what my "business name" was. I knew by then that the term "Large Scale" was meaningless to most people. And I wanted to emphasize the family aspects of the hobby. So I invented the name "Family Garden Trains" and started using it in my contact information. Writing articles was, technically, a form of communication, which still fit the "charter" of Breakthrough Communications. So instead of registering "Family Garden Trains" as a separate entity, I would put "a subsidiary of Breakthrough Communications" or some such on my materials. In 1998, changes in my circumstances gave me space and time to start my first "permanent" garden railroad. 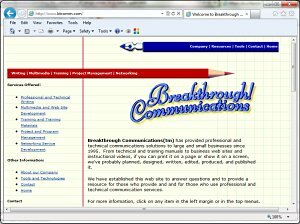 In 1999, I experimented with posting photos and accounts of those early efforts on btcomm.com/trains/, a subdirectory of my consulting business site. At first I used the name of my railroad - the New Boston and Donnels Creek - at the top of the page. When I started adding in my articles about garden railroading in general, I realized that the name "New Boston and Donnels Creek" was too specific for a site that could become a general resource for other beginning garden railroaders. So, in early 2000, I put "Family Garden Trains" at the top of the page. I ran it past some friends and a couple industry experts for feedback before I made the pages public. Response was very positive. If all of this sounds very casual and unplanned, please remember that I had a full-time day job (usually), garden railroading was only a hobby, setting up a garden railroading web page was only a hobby, and the web was still more-or-less in its infancy. Furthermore, at the time the online garden railroading community was pretty small, and mostly close-knit, if you discounted so-called "controversies" that certain individuals with vested interests liked to keep rehashing. That's why I was so surprised when I tried to register the domain name FamilyGardenTains.com. I discovered that a "fellow hobbyist" with his own garden railroading site had registered the domain name FamilyGardenTrains.com to keep me from using it. In the early days of the web, there wasn't nearly as much of this kind of squatting as you see now. I certainly didn't expect it in our "community." Apparently the other site owner thought that since his site came first, he should "own" garden railroading on the internet, and my handful of articles would be too much competition for him. I could have chosen another name. But the name "Family Garden Trains" was already gaining traction among people who counted, and I figured the fellow would have too much sense to try to start his own site with the same name. So I registered the domain name "Family-Garden-Trains.com," and put that on the page, on flyers, etc. Why didn't I go after the "squatter" right then? At the time, there were enough other goofy arguments going on in the hobby. Besides, the squatter and I had a lot of mutual friends and it would have been unpleasant to force them to take sides. So instead of starting yet another "controversy," I spent my time putting to rest the so-called controversies that plagued the early days of the hobby. I say "so-called" because if you had all the facts about scale, coupler height, flange depth, manufacturer preferences, power systems, naming conventions, etc., there wasn't really anything to argue about besides personal preference, essentially Ford/Chevy arguments that nobody should have been taking seriously. 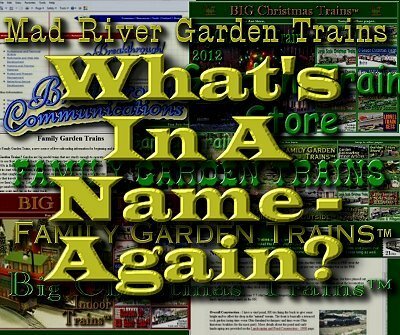 Family Garden Trains (hosted on btcomm.com/trains) gave me a platform to publish a series of objective, fact-based articles that nobody could credibly disagree with. Over the following months, with the help of a few industry experts, we demonstrated that the hobby was big enough for all of us. Our articles on scale and power systems originally dated back to that era, though they've been updated since (and will be updated again when we've sorted out some of the problems this article describes). As time went on, I added features and changed the look-and-feel of the site, adopting Copperplate Bold as the title font and deep green as a theme color. Still, it was unpleasant to know that every time someone who had heard of Family Garden Trains entered "familygardentrains.com" in their browser, they got a "site out of order" message. But after spending so much time cooling down stupid arguments, I didn't feel good about starting another war. At the time, almost all of my pages used "relative linking" to link among pages. That is, internal links did not include the full name of the site, only directions for how to get from one page to another page within my site. If I ever DID get the name FamilyGardenTrains.com back from the squatter, and set up a separate hosting account, I could just to move the whole collection of files to the new server, and everything would still work, because the relationships among the files would stay the same. Unfortunately, other folks noticed the same thing. About 2004, I started noticing that certain sites were copying large sections of my site wholesale onto their sites. (These were not people in the garden railroading community, in case you wondered. Rather they were people who had set up advertising-supported "how-to" sites and were stealing "how-to" articles from all over the intenet so they'd have more pages to put advertising on.) Because of my relative linking, the pages that the pirates "borrowed" worked just as well on their servers as they did on mine. I figured I could foil the pirates by replacing the relative links with "absolute" links* that would include the full path to the file on btcomm.com/trains/ site. Now, even if a whole bunch of pages were copied to a "foreign" site, anyone who clicked on a link would find themselves back on my site anyway. It was sort of a homing device for my pages. Within a couple of years, I had tens of thousands of embedded links to btcomm.com/trains/ on my pages. The folks who had been borrowing my pages wholesale pretty much gave up, since they were too lazy to redo the links, and all they were really doing was sending more readers to my site. So I "won" that round. Yes, some of you are ahead of me already, especially the folks who have seen Charley Wilson's War**. Eventually, additional issues forced me to put pressure on the fellow who was sqatting on the name FamilyGardenTrains.com. There were some unpleasant moments, and I was called a number of interesting names, but he stopped renewing the registration, and the next time the name came up for renewal I was able to snag it. By then, almost every relevant Google search was bringing some page of my site up on the first or second screen, with the url btcomm.com/trains/whatever. So when I registered FamilyGardenTrains.com, I set it to redirect to btcomm.com/trains/ and let the files there for a few more years while I worked on things that readers cared about. And they cared about a lot. Most of my article ideas were coming from reader questions. When I found myself answering the same questions repeatedly, I would do any additional research needed, organize my thoughts into an article, circulate the draft to industry and hobby experts, and publish it online. Within a few years I had nearly a thousand articles on the Family Garden Trains site alone. By 2004, we were getting questions and article suggestions about a wide range of projects and hobbies. Many of the the questions didn't fit into a garden railroading web page at all, but often they "clustered" around hobby segments that were underserved or unserved on the internet. On30, for example. As these other areas of interest took on a life of their own, I added several other web pages, all with domain names I registered as soon as I thought of them, and all pointing to subfolders on btcomm.com. 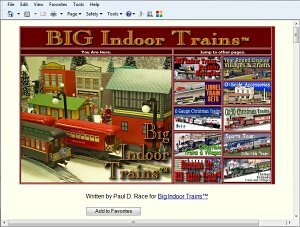 The largest of these "secondary" sites was "BigIndoorTrains.com," which I started to address our most common reader questions about On30, O gauge, and holiday villages (which are often O or S scale). In late 2004, a company that sells Christmas-themed collectible trains consulted me about posting ads for their products. As an experiment, I started a mini-site called BigChristmasTrains.com on yet another subdirectory of btcomm.com/trains. It wasn't just an online catalog, though. I added articles about setting up trains at Christmas, making your own accesories, etc. Before long, the new site was actually making a few dollars a month, enough to pay its own expenses, at least. Advantages of this setup included not having to buy or handle merchandise, or to report inventory on my taxes, etc. Technically, I was not a "retailer." I was a "publisher" getting paid for advertising, so the name Breakthrough Communications still covered what I was doing. Still, I wished I could do something similar for garden trains, which I still loved way more than Christmas trains. And I was getting questions from folks in out-of-the-way places about where to find certain equipment. 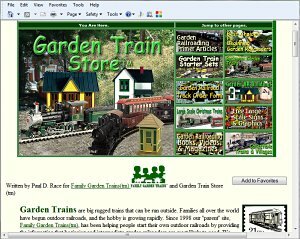 So, I came up with the name "Garden Train Store," dummied up a page, and started contacting garden train vendors to see if I could help them sell garden trains the same way I was working with the Christmas train people. One of the business owners I talked to was so excited that his tech guys built the requisite links for me to use before they even got back to me. The next company I contacted was one I had talked with back in my pre-Web "Mad River Garden Trains" phase. The owner had seemed like a decent guy, and many of his sales people and reps had been helpful in other contexts. When I contacted the owner about my Garden Train Store idea, he told me to talk to his "I.T. guy." The "I.T. guy" said he'd get back to me but never did. A few days later, I discovered that the "I.T. guy" had no interest in working with me, but he had registered the domain name "GardenTrainStore.com" almost as soon as he got off the phone. I called the "I.T. guy," who first laughed at me, then urged me to relocate to a metaphysical realm with a permanent heat index warning. He didn't say it that nicely, of course but this is a family web page. Then I called the owner, who told me he would sue me for harrassment if I ever "bothered his people" again. Later I learned that, in the early days of the Web, the same company had squatted on the trademarks of at least one competitor, and the owner had even called the owner of the other company to laugh and brag about it. So to these people, usurping other folks' trademarks was just a game. But since they had over a million times my assets it was a game I couldn't win. By that time, the "good" vendor was already selling trains to my readers under the name Garden Train Store. So I registered the domain name "Garden-Train-Store.com," left the files on btcomm.com, and focused on writing articles that answered reader questions. Talk about deja vu. By now, as you must imagine, all of those pages hosted on the same archaic Unix server site were starting to get pretty crowded. So I asked my service provider to give me more space. They gladly accommodated me, putting several hours into porting my stuff from the poor overloaded Unix "boat anchor" to their big, shiny new Windows servers. I knew enough about the differences to know you couldn't go the other way (for example, Windows ignores capitalization in file names but Unix pays attention). But I didn't expect any problems migrating from Unix to Windows. After all, I was developing my pages on Windows computers. What could go wrong? Unfortunately, I learned that my files included a lot of archaic code and scripts that the shiny new Windows servers did not retroactively support. A number of things broke that always worked before. "Easy," said my ISP's techs, "Just run such-and-such code analysis software on your thousand pages or so, and update all the pre-HTML4 code by hand." "Easy," said me, "Just put me back on the old server and I'll figure something else out." They did and I did. Some years earlier, GoDaddy had offered free basic web hosting if you registered a domain name (a temporary promotion). I tried it, and discovered that the "free" site had advertising on the top of every page. After the failed attempt to move my sites from Unix to Windows, I took another look at GoDaddy's "free" sites. I was entitled to several, and, best of all, the advertising had disappeared. So I tried moving a couple of my little sites over to Linux hosts. Everything worked. So I moved most of my other sites over. Everything one each site still worked, except that many of the links on each site still pointed back to the old addresses on btcomm.com. Since most of the little sites only had a dozen or two pages, it was no great hardship to go through and replace all the links to btcomm.com/ with links to the new sites using the actual domain names. BigIndoorTrains.com took a while, though. Finally, the only sites left on btcomm.com were my original Breakthrough Communications site and Family Garden Trains. I even set up a site called "Family-Garden-Trains.com." It held a mirror image of my btcomm.com/trains files, but hundreds of absolute links, plus 99.99% of the Google hits still pointed to btcomm.com. I figured I'd leave the main site where it was. After all, I had all kinds of room left on that server now, and the redirects were still working perfectly. As far as readers were concerned, FamilyGardenTrains.com was on a dedicated server. What could possibly go wrong? Would it make you believe in Karma if I told you that the 2008 recession put the company that had squatted on the name "GardenTrainStore.com" out of business? I didn't gloat, though. The majority of the folks at the store that were great, helpful people who didn't deserve to lose their jobs because of fraudulent banking practices in another state. The recession also put the "good" vendor out of business and nearly killed off several major manufacturers. Needless to say, I checked to see the registration status of GardenTrainStore.com. Unfortunately, the "I.T. guy" had registered the name "GardenTrainStore.com" until 2012. But in 2012, his registration timed out and - after a brief tug-of-war with a professional squatter - I snagged it. By this time, I had migrated Garden-Train-Store.com to a separate hosting account, and it was working just fine. Since I now owned both names, I left the files where they were and redirected GardenTrainStore.com to Garden-Train-Store.com. What can possibly go wrong with that plan? Remember the archaic Unix server that my sites had managed to outgrow? My ISP finally decided that it was costing too much to maintain, so they took it off life support and moved my remaining two sites to a Linux server. The sites themselves worked perfectly, as I expected, based on porting my other sites to Linux. But several redirection features that made readers feel like FamilyGardenTrains.com was on a dedicated server no longer worked, and the ISP's tech guys didn't know how to make them work. Moving Family Garden Trains' files to the new host was a matter of copying things over. But every one of my thousand or so HTML files held about a dozen links to btcomm.com/trains/. Many of those links are embedded in the text so I have to do a manual text search within each file to find them. I can't even do a global "search and replace," because I had to tweak several of the directory structures when I moved to the Linux servers. It all has to be done "by hand." Back to the Charley Wilson's War paradigm: a few years earlier I had foiled content pirates by putting tens of thousands of absolute links into my pages. Unfortunately they all pointed to a site I subsequently had to move away from, so I have to redo every one of those links. Of course when I'm finished, nothing else can possibly go wrong. Right? I hope you can see the ironies in all of this. If I had had just a bit more resources and made just a few better choices 14 years ago, almost none of this rework would have been necessary. The following list of do's and don'ts is not comprehensive, nor would it take a "rocket scientist" to figure most of this stuff out on your own. But if following this advice while you're starting out saves you hundreds of hours of rework later on, this article will have accomplished its purpose. When you start anything that might be a "business," consider using a relatively non-specific business name and charter so that if you have to migrate to some related field, you don't have to throw away your name, "good will," etc, and start again. Also, consider making the name shorter than "Breakthrough Communications." You'd be amazed at how much time this will save you in filling out paperwork. If you come up with a great name for a web site, register it before you tell anybody, even your closest friends. I know that's a lot easier to say now that registration costs $15 or so a year, versus $75-$125 back when I was starting out. Once your site goes live, register the most likely variations of your domain name. I didn't add this into the account above, but two different individuals have set up web sites with deliberately similar names to my web sites. One of the sites even copied the look-and-feel of my site for a time. Of course, if these folks' real sites actually had content worth linking to, they wouldn't need these subterfuges. If (and only if) your domain name points to the host where the files actually sit (no redirects), consider using absolute links for every internal page jump in your site. That way, if someone tries to borrow your site's contents wholesale, any links will simply bring readers back to your site. If you use relative links to images, it's a lot easier to maintain pages on your computer, especially if you're some place without an internet connection. If you use absolute links, Google image searches are more likely to bring folks back to your site than to the copycat. I tend to use relative links for graphics that show on the page when it's first opened and absolute links for "popup" graphics - the "click for a bigger picture" images. But I'm not consistent. Yes, I know, that's not entirely helpful, but it's honest. Don't be afraid to wait out jerks. If I'd started a war or a lawsuit every time someone thought they got the better of me, I'd be broke and our resources wouldn't have nearly as much useful content as they have now. By waiting out jerks, I won out in the end without causing bigger problems. No, not everybody who tries to take unscrupulous advantage of you is going to have their businesses dramatically fail. But (here's a freebie that I didn't touch on in the article above) in the world of hobby web pages, and even hobby retailing, lots of folks are ADD - they throw all their energy into the hobby and their web pages or stores for a few years. Then they get interested in some other hobby, and let everything they've built in the meantime "die of natural causes." When someone wants to start a fight with you or take unfair advantage, you may be able to "win out" in the end simply by outlasting them. The list above may seem a little anticlimactic after all of the historical accounts. If you're an experienced webmeister or have had one good instructor, you might be thinking "any fool knows that." But fourteen years ago, when I made some of my biggest mistakes, this stuff wasn't universal knowledge. Of course describing all of these mistakes may cause a few readers to lower their opinion of my intelligence. But my hope is that my sharing drives home the point that a little forethought and care in the early stages of web site development (or any enterprise) might save countless hours of rework later. If you have any similar experiences you'd like to add, or if you're, say the "I.T. guy" who told me where to get off, and you want to tell your side of the story, please get in touch, and I'll gladly share any responsible responses on this page. In the meantime, please enjoy your trains, and especially enjoy any time you have with your family in the coming weeks. Open a page in the new folder (fence_posts.htm). The absolute link would be "http://familygardentrains.com/trains/primer/fence_posts/fence_posts.htm." ** The movie features a jaded American agent who greets every apparent setback or success with "we'll see," meaning that apparent victories may cause bigger problems down the road, and apparent setbacks may be blessings in disguise. Spoiler alert: If you ever watch that movie and can't connect the dots between training and arming extremist Mujahideen warriors to drive the Russians out of Afghanistan and a certain subsequent war, contact us and we'll sort it out for you. Note: Family Garden Trains�, Garden Train Store�, Big Christmas Trains�, BIG Indoor Trains�, and BIG Train Store� are trademarks of Breakthrough Communications (www.btcomm.com). All information, data, text, and illustrations on this web site are Copyright (c) 1999, 2000, 2001, 2002, 2003, 2004, 2005, 2006, 2007, 2008, 2009, 2010, 2011, 2012, 2013 by Paul D. Race. Reuse or republication without prior written permission is specifically forbidden.